The second day was a gathering for the staff and their children to let them know how much we appreciate their devotion in cooking, cleaning, teaching, guarding, farming and caring for our children. 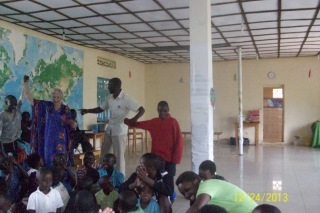 They also played games had juice and cookies and the children received gifts and the staff a small money gift. 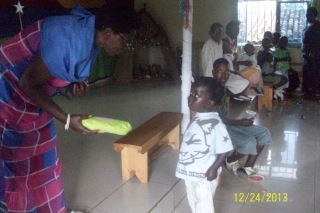 This was funded by donations from those who support Urukundo year around. Hot Potato. When you lose you sit in the middle. It was great fun. The two finalists. The guy in the red shirt received the prize! 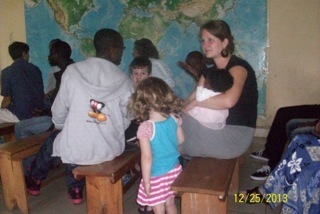 Children of staff in center with our kids. 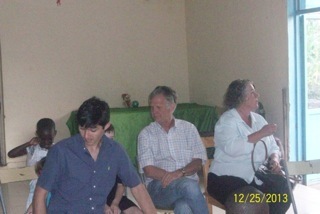 Christmas Day was for our family and invited guests. We thank Margie and Bruce and their family for providing funds to buy 3 turkey for our meal and for the gifts they brought for the kids. Ice Cream was a special gift from them. The kids had mixed feelings about the ice cream because it was too cold. Christmas was wonderful but simple and we do thank all who made it possible. Guests from Denmark. They later sang us a beautiful Christmas carol from their native land. Maureen and Kyle were part of the celebration. 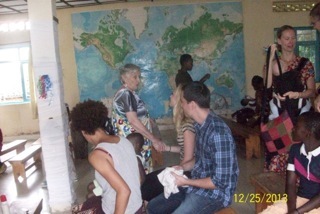 Joining us were Erica and Thomas from Sweden. Bruce, Margie and son in law Adam. Claudine in back ground. Michelle gets a new baby girl, Iris is not so sure she likes that. Mama & baby girl weary and ready for rest. Brother Isaac looking on. THE SENIOR KIDS CHOIR sing Joy to the World & other Christmas songs.